When users of the updated Apple TV unpack their new gadget and connect it to their TV they’ll be impressed by the many new features available, including a brand-new App Store like the one iPhone users have been going to for years. One of the new apps is the Cedarville Chapel app, which gives more people access to Cedarville University’s daily chapel services. The app is free and available now at the App Store. 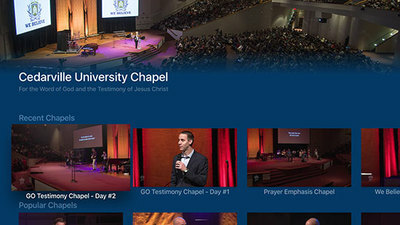 The Cedarville Chapel app lets users watch chapel in real time through live streaming as well as watch archived chapel broadcasts. The new app is just one of many ways that Cedarville’s web team has been expanding access to chapel for those outside of the University. Weinstein, Mark D., "Chapel App Comes to Apple TV" (2015). News Releases. 211.